Many of you will have noticed the latest MCS standard for Biomass includes Annex B - "Requirements for Biomass with Incidental Cooking Capability". 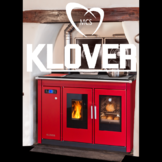 We cooperated with the body preparing that standard and the specifications were based on the Klover Smart 80 and 120, as they are the only two approved cooker boiler products on the market that are MCS registered. We are therefore pleased to say that KIWA (our MCS certification company) are fully satisfied that both the Smart 80 and Smart 120 comply with MCS008.